Faded blue jeans … is there anything in life more comfortable than your favorite old pair of faded blue jeans? 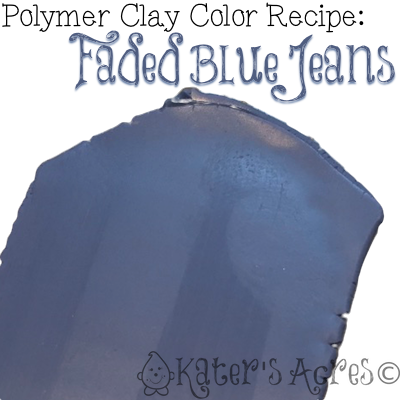 This polymer clay color recipe will show you a simple and basic recipe to mimic those old worn favorites. Are looking to make your own polymer clay color recipes and don’t know how or don’t know where to begin? Don’t look any further than this article on Making a Color Palette 101. And be sure you don’t miss any of my free color recipes by visiting here. Add 1 parts additional Ultramarine for more blue. Add 4 parts additional Turquoise for brighter blue. Add 2 parts additional Blush for more purple tint. Thank you so much for sharing this! I was in need of a recipe for this exact recipe for one of the beads I make for my butterfly earrings. It was perfect! Thanks, again! That’s so wonderful! I’m so glad you can use it Manida. Thanks for chiming in and sharing how you used it too.